Hebei Lantan Import and Export Trade Co.,Ltd , Aprofessional production and export company, Have many cooperation pipe manufacturer which integrates design, production, Company boss paid a lot of stock from the manufacturer, With fastest delivery capacity. Hebei Lantan Import & Export Trade Co.,Limited, Aprofessional production and export company, Have many cooperation pipe manufacturer which integrates design, production, Company boss paid a lot of stock from the manufacturer, With fastest delivery and transport capacity. Factory has 300 employees, (Senior managerial staff members, Senior technicians, Engineers, And others workshop staff), Has boasts 40 sets of large and medium machining equipment for producing tubing in various specifications, and process equipment and testing instruments and meters needed for nondestructive testings, physicochemical tests and pressure tests, etc. HDPE water supply pipe, HDPE silicon core pipe, HDPE Double-wall corrugated pipe, PE drip irrigation pipe, PE drip irrigation tape, HDPE Steel skeleton pipe, PE soft tape. PVC-U water supply pipe, PVC-U darainge pipe, PVC-U irrigation pipe, PVC graden hose, PVC stell wire reinforced hose, PVC square/rectangular pipe. PVC NFT hydroponic pipe/channel, PVC NFT hydroponic tower, PVC plant growing gutter, PVC cultivation bag gutter, PP hydroponic vertical plant Pot, Automatic planting of seedbed. 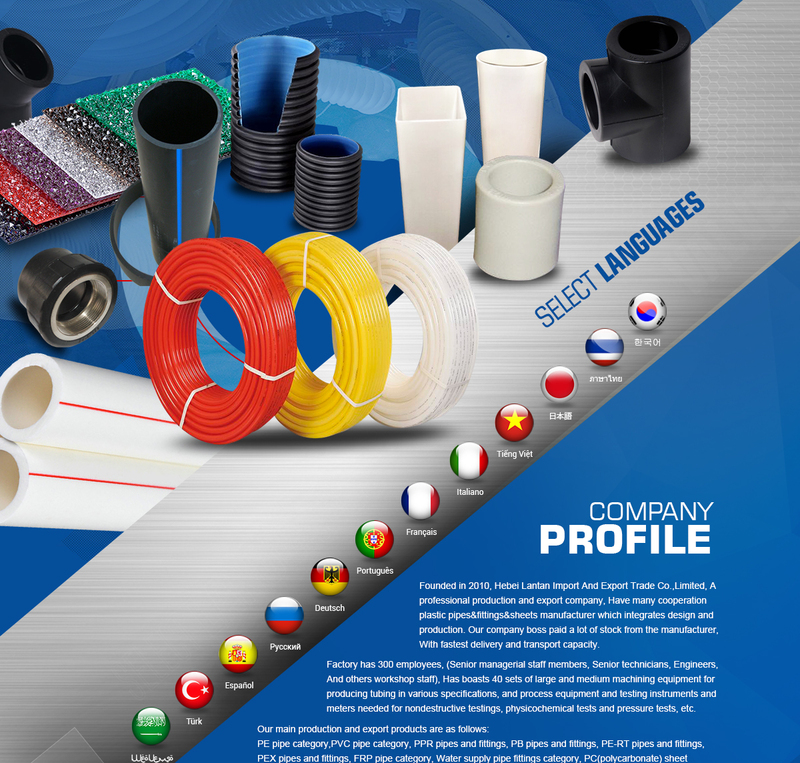 PPR pipes and fittings, PEX-a pipes and fittings. MPP electrical pipe, CPVC electrical pipe, PVC-U electrical conduits, FRP cable protection pipe , HDPE porous plum tube. Also can supply Polycarbonate sheet, PVC foam board, EPP foam sheet. And others plastic pipes and sheets. Our products find wide application in various fields. Our company has won the title of "contract-abiding and credit honoring enterprise" conferred by provincial and commercial administrations for three consecutive years, And been awarded with' certificate of product quanlity conformity" by Hebei Quality Inspection Bureau, With strict quality management system, The company guarantees product quality through production, transporation and service. Our company keeping to corporate spirit of " solidarity, endeavor, pragmatics, and innovation". Quality strives for the survival. Hebei Lantan Import & Export Trade Co.,Limited values " Quality, Customer, Credit" first. WELCOME CUSTOMERS TO VISIT OUR COMPANY, WE ARE SINCERELY LOOKING FORWARD TO CORDIAL COOPERATION BETWEEN US FOR MUTUAL BENEFITS! !